Based on the Jakers! 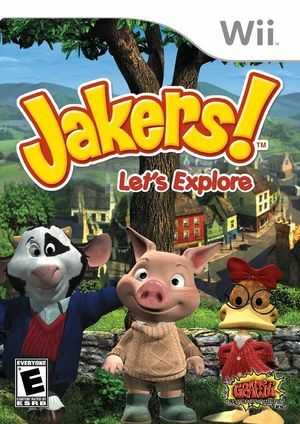 characters from the hit animated children's series comes a new interactive adventure, Jakers! Let's Explore. Explore the village of Tara, Raloo Farm, and the countryside of rural Ireland in this all-new adventure game for children aged 3-6. Choose to play as Piggley, Dannan, or Ferny using simple point-and-click controls to interact with the world. "Jakers! Let's Explore" is divided into several individual "stories" each with its own varied objectives designed to entertain while also teaching simple positive morals. Told in the familiar flashback style of the TV show, each story is intended as an individual play session of about 30 minutes though new stories can be started as soon as one is completed. The game play consists of several different mini games (about one for each story) in addition to a "stamp collection" of all the various plants and animals that you will discover and explore throughout the whole adventure. The graph below charts the compatibility with Jakers! Let's Explore since Dolphin's 2.0 release, listing revisions only where a compatibility change occurred.